How do you give your students the opportunity to practice MP8: I can look for and express regularity in repeated reasoning? We started our dilations unit practicing MP8, noticing and noting. What would you want students to notice and note? How do students learn what is important to notice and note? What happens when the center of dilation is on the figure, outside the figure, and inside the figure? What happens when the scale factor is greater than 1? Equal to 1? Between 0 and 1? Less than 0? I observed, walking around the room and using Class Capture, selecting conversations for our whole class discussion. Here’s what NA noticed and noted. We looked at Hannah’s Rectangle, from NCSM’s Congruence and Similarity PD Module. Students had a straightedge and piece of tracing paper. 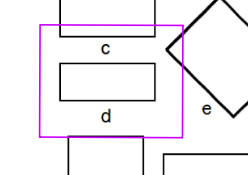 Which rectangles are similar to rectangle a? Explain the method you used to decide. What would you do next? Would you show the correct responses? Or not? Would you start with an incorrect answer? or a correct answer? Would you regroup students based on their responses? 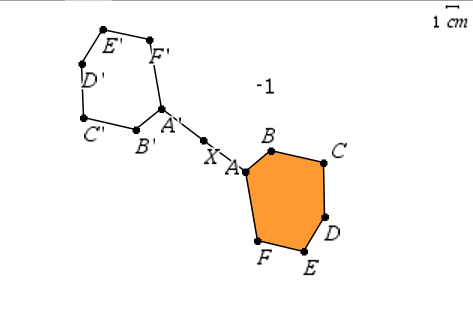 I started with a student who didn’t select G and then one who did. Then I asked a student who selected C to share why he chose C and didn’t choose F. We ended by watching Randy’s explanation on the module video. Are you aware of all that NCSM has to offer? Many resources are free on their website, and there are additional resources with a paid membership when you login to My NCSM. I learned about their Illustrating the Standards for Mathematical Practice modules at the NCSM conference a few years ago. While I haven’t reviewed all of them, I’ve been using ideas from their Congruence & Similarity module ever since both with my students and in professional development with teachers. 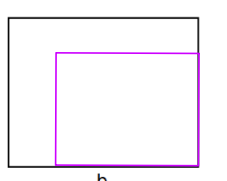 One of my favorite tasks from the module is Hannah’s Rectangle Problem. 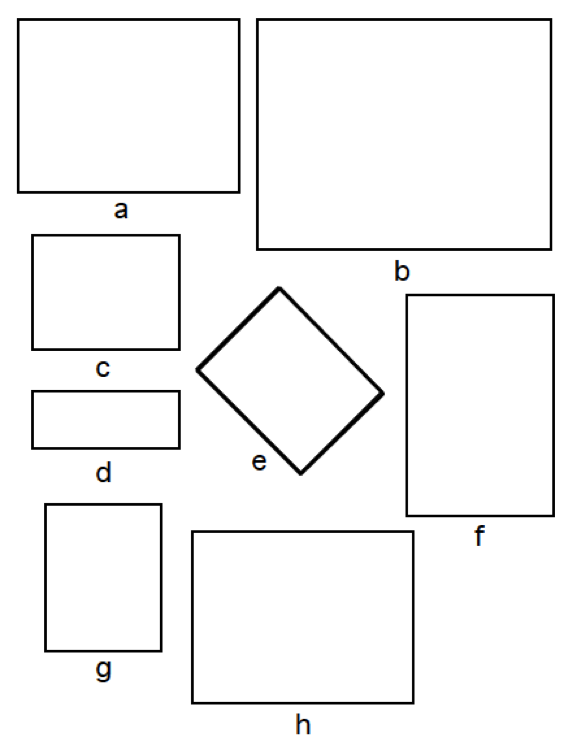 Students determine which rectangles are similar to rectangle a and explain how they know. I set the class mode to individual and sent a Quick Poll to collect their results. I think CS shared with the whole class first. (I’m writing the post two months after the lesson & can’t remember for sure.) 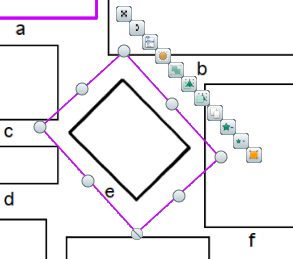 CS had traced rectangle a & transformed the rectangle so that it shared a center with each rectangle. 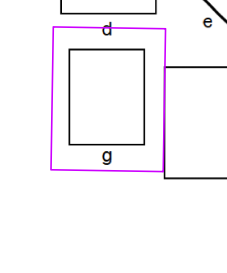 I know that c, b, e, and g work because the space between the dilated rectangles has the same “width” all the way around. 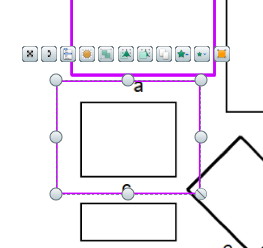 CS showed us what he meant, talking about the “frame” that forms. 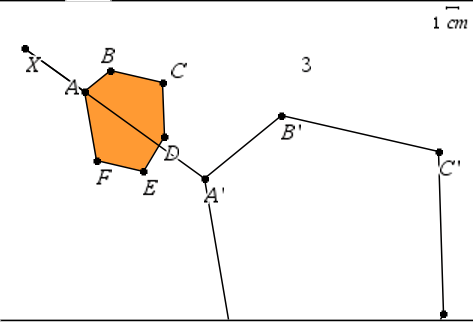 AC added that she did that, too, but she eyeballed the length between corresponding vertices to check for similarity. Another student noted that h works because the two rectangles are congruent, which of course made us think about why similarity does not imply congruence but why congruence does imply similarity. What about one that doesn’t work? 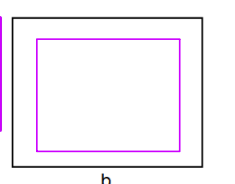 CS shared what he did with rectangle d, and showed how the horizontal width of the “frame” isn’t the same as its vertical width. 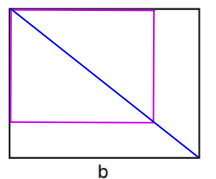 Can we check whether one rectangle is a dilation of rectangle a using a different center? At this point, we watched the video that accompanies the NCSM learning module, so that students could see Randy’s method. Had one of my students come up with Randy’s method, of course we wouldn’t have watched the video, but they didn’t, and so I was glad for a different source of learning other than me. CCSS-M 8.G.A.4. Understand that a two-dimensional figure is similar to another if the second can be obtained from the first by a sequence of rotations, reflections, translations, and dilations; given two similar two-dimensional figures, describe a sequence that exhibits the similarity between them. CCSS-M G-SRT.A.2. 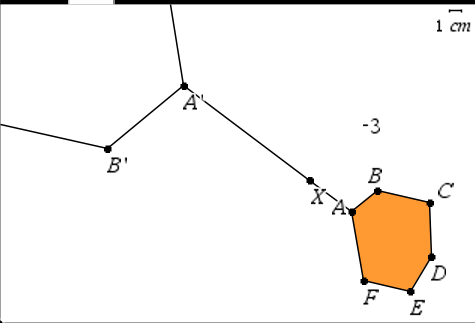 Given two figures, use the definition of similarity in terms of similarity transformations to decide if they are similar. 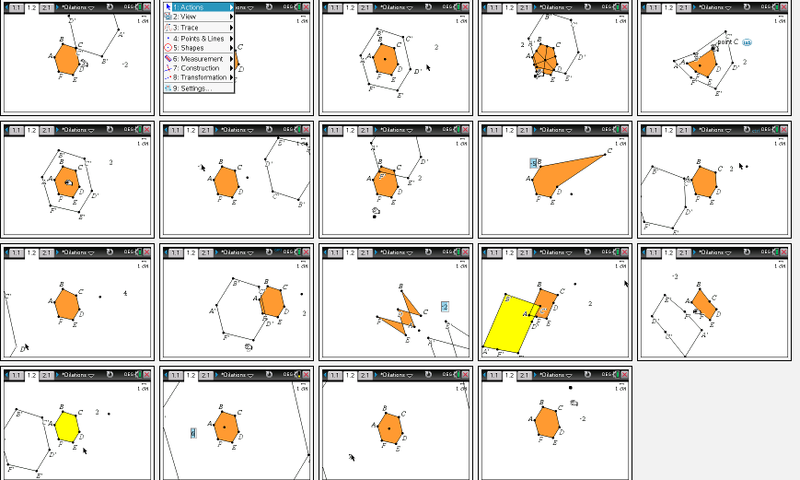 Students then dilated a figure using our dynamic geometry software and played. 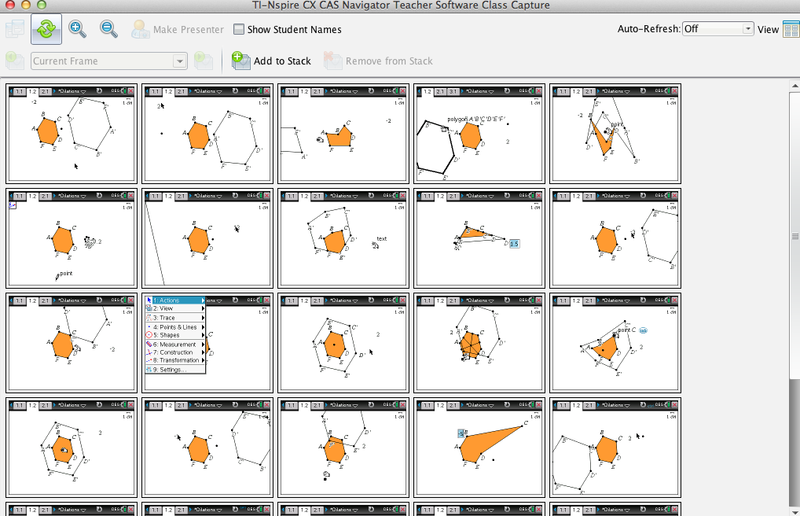 I watched using Class Capture. What happens when you move the center of dilation? What happens when the scale factor is 3? 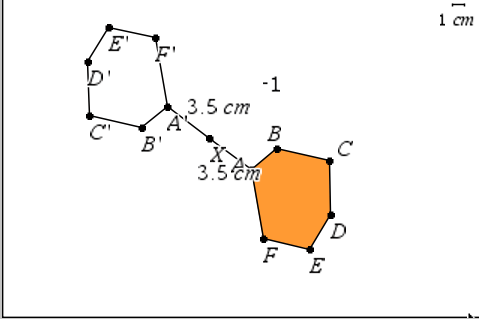 What changes when the scale factor is –3? What is significant about a scale factor of –1? 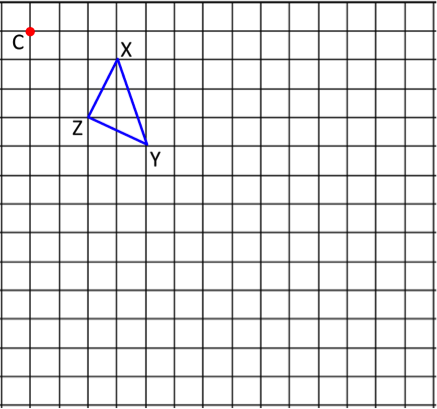 Dilate ΔXYZ about point C by a scale factor of 2. 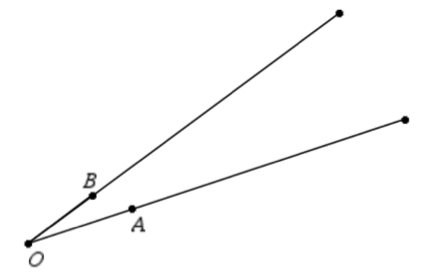 Dilate points A and B about point O by a scale factor of 3. And so the journey continues, with many thanks to NCSM for all of the work they do to provide worthwhile resources to the mathematics education community. #NCTMLive and #T3Learns webinar: Implement tasks that promote reasoning and problem solving, and use and connect mathematical representations. Webinar: Establish Mathematics Goals to Focus Learning, and Elicit and Use Evidence of Student Thinking.